Neo-communist South Africa is moving ever closer to the Peoples Republic of China. The two countries now apparently enjoy a "strategic partnership". Who better to represent the South African side of the equation, than president Mbeki's right hand man, Soviet trained SA Communist Party leader, Essop Pahad? 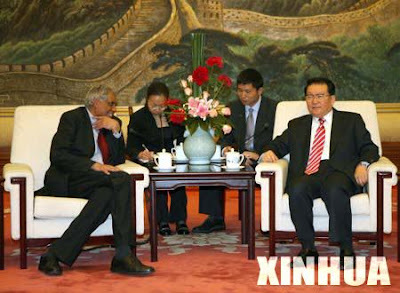 Li Changchun (R), member of the Standing Committee of the Political Bureau of the Communist Party of China (CPC) Central Committee, meets with South African Minister in Presidency Essop Pahad in Beijing, capital of China, Sept. 18, 2007. A senior official of the Communist Party of China (CPC) on Tuesday called for stepping up exchanges and cooperation between China and South Africa to further their strategic partnership. Li Changchun, member of the Standing Committee of the Political Bureau of the CPC Central Committee, made the remarks when meeting with Essop Pahad, minister in Presidency of South Africa. Li said the two countries enjoy profound traditional friendship and also share practical common interests. Bilateral relations have developed smoothly since diplomatic ties were forged nearly ten years ago. The two countries have established strategic partnership and witnessed frequent exchanges of high-level visits, rising political mutual trust and rapidly growing economic and trade ties. He said as the tenth anniversary of the establishment of diplomatic ties approaches, the two countries should step up exchanges and cooperation in political, economic, cultural and press sectors to further promote their strategic partnership. Pahad said the government of South Africa is willing to strengthen exchanges and cooperation with the Chinese Government and further push forward exchanges and cooperation in the press sector to enhance mutual understanding and friendship between the two peoples.